I started in my present job in August 2010. It's a small outpost of a very large multinational corporation. There are twenty employees in the office, including three temporary contractors. Finance and accountancy industries tend to be female dominated, and our office is no different. There are just four men in our place. When I started there, there was one heavily pregnant lady in the office, the first pregnancy in the company in four years. August '10: I join company. One pregnant colleague, Anne, seven months pregnant. Sept '10: Marie announces her pregnancy, Susan joins the company, returning to work after the birth of her first child. Oct '10: Anne goes on maternity leave, and gives birth to a daughter. Dec '11: Eve gets married. Feb '11: Eve goes on honeymoon for a month. March '11: Marie goes on maternity leave, and gives birth to a son. April '11: Susan announces her pregnancy. May '11: Aoife joins the company as a project accountant on a year's contract. She is also returning to work after the birth of her first child. August '11: Anne returns from maternity leave. Oct '11: Susan goes on maternity leave, and gives birth to a daughter. Nov '11: Sinead gets married and goes on honeymoon for a month. Dec '11: Aoife announces her pregnancy. Sinead returns from honeymoon. Kate gets married on New Year's Eve and goes on honeymoon for a month. Jan '12: Marie returns from maternity leave. Kate returns from honeymoon. Feb '12: Eve announces her pregnancy. March '12: Kate announces her pregnancy. April '12: Sinead announces her pregnancy. Colleagues joke about pregnancy being contagious. It's in the water they say! I quip that I'm drinking three pints of the Goddam stuff a day. One of the pregnant people says straight back to my face - you're drinking the wrong water, Jane. Ouch. May '12: Last Friday we send Aoife on her merry way with lunch and gifts. Her contract was due to finish up soon, and her doctor wanted to sign her off work, so she has finished up a few weeks in advance of her due date. Last Monday Anne arrives back from her holidays after a trip to Venice for her thirtieth birthday, to announce her second pregnancy. As soon as she walks out of our office, I have a mini nervous breakdown. Sobbing, tears, snot, irrationality, the whole nine yards. I leave the office at lunchtime, because at this stage I have cried myself into a migraine and the tears are showing no sign of abating. Because I will be forty three this day week. Because Monday was the five year anniversary of the day we lost our third pregnancy, the one in my mind that should have made it. Because I just know that I will never come into work and say "guess what lads, I was drinking the right water all along! I've caught that bug that's going around! I'm one of you!" Because I am now the only married woman in the office who is neither pregnant nor a mother, and it hurts so bloody much. Ah, infertility. The unwanted gift that never, ever stops giving. In the 21st Century world we live in, there are a number of different ways to build family. Most couples manage to do it the old fashioned way that has kept the human race going for millions of years. For other people, who are infertile due to either social circumstances of not meeting the right partner at the right time, or medical reasons which prevent them conceiving or carrying a baby to full term, it’s not so simple. Reproductive technology, adoption or fostering, or choosing to live a childfree life are some of the possible ways forward for them. We are one couple who could conceive but not carry a pregnancy to term. This Christmas we have found a different way of forging familial ties. For the past two weeks we have been host Mama and Papa to two little seven year old girls from Belarus, and they have changed our lives in a way I would never have thought possible. As I am sure most people reading this are aware, the largest nuclear meltdown in the history of Europe happened in Chernobyl, Ukraine in April 1986. The story of the disaster and its ongoing consequences for the countries of Belarus, Ukraine and Western Russia can be read about here. The stories of the liquidators, who saved Europe from a potential explosion which could have killed hundreds of thousands and left Europe a wasteland. Everybody remembers the brave heroes of 9/11, but how many remember the heroes of Chernobyl? In 1991, an Irish woman called Adi Roche was working as a full-time volunteer for the Irish Campaign for Nuclear Disarmament, when she received a fax from Belarus with the simple message ‘SOS Appeal. For God’s sake help us to get the children out.’ So began her life’s work, to form Chernobyl Children International, which since its establishment in 1991 as a nonprofit charity organisation, has delivered over €90 million in humanitarian aid to the Chernobyl region. As well as large organisations like CCI, there are hundreds of smaller Chernobyl Support organisations all over the world, particularly in Ireland, who are ploughing their own smaller scale furrows, helping the children of Chernobyl in small but very significant ways. One such organisation is Chernobyl Lifeline Ireland, based in the town of Roscrea, County Tipperary. They have been working with people in the town of Mikashevichi, in the Brest region of Belarus for the past sixteen years. This is a town into which a large number of evacuees were resettled from the regions which were so contaminated following the disaster; they were rendered no-go areas, to be deserted for thousands of years. We were told that when rural areas were being evacuated, priority was given to the cattle and other farm animals over the people. Mikashevichi continues to this day to bear the social scars of a displaced people, uprooted from their homes and placed in urban high-rise buildings with little or no financial compensation for their lost homes and livelihoods. The people of Chernobyl Lifeline Ireland work on an entirely voluntary basis, some travelling to Mikashevichi to bring seriously ill children to Ireland for medical treatment and recuperation. Others open their homes to children in disadvantaged circumstances for recuperation vacations. While these children may show no obvious signs of illness, the long-term legacy of Chernobyl has left them breathing contaminated air and eating from a contaminated food chain for their entire lives. It is estimated that for every vacation of three to four weeks these children take outside of their own country, up to two years is added to their long-term life expectancy. Recurrent vacations to countries like Ireland can literally help them to live for decades longer than expected. By far CLI’s greatest success story is that of a twenty two year old young woman called Ella. Ella was found by a member of CLI in Mikashevichi at the age of nine years old. She had spent the previous year of her life in hospital, and had been sent home to die. Her mother, a twenty seven year old single mother at the time, was told that her only daughter was suffering liver failure. With her mother’s permission, Ella was brought to Ireland for a second opinion. She was unable to walk when she arrived and had to be carried off the aeroplane. Their first port of call was to a paediatrician in Roscrea, who said she was the most ill child she had ever seen in her life. Ella was placed with a host family, and remained in Ireland for six months. Within a few weeks, she was up and out playing with other children. After six months she was healthy enough to return to her mother. Her host family sponsored her through her education, and she is now a college graduate, working as a schoolteacher in Belarus. This Christmas she returned to Roscrea as the group’s interpreter. She visits Roscrea twice a year and speaks warmly of her Irish family. We met her for the first time this Christmas and she is an amazing young woman, someone I am proud to call a new friend in our lives. We decided to sign up as volunteers with CLI after having attended an information session on international adoption this summer. We were advised to get as much practical experience with children as possible before embarking on the adoption process. That night we went home and wracked our brains for ideas on how to achieve this. Then I started to Google volunteering and children’s charities, and up popped the answer. 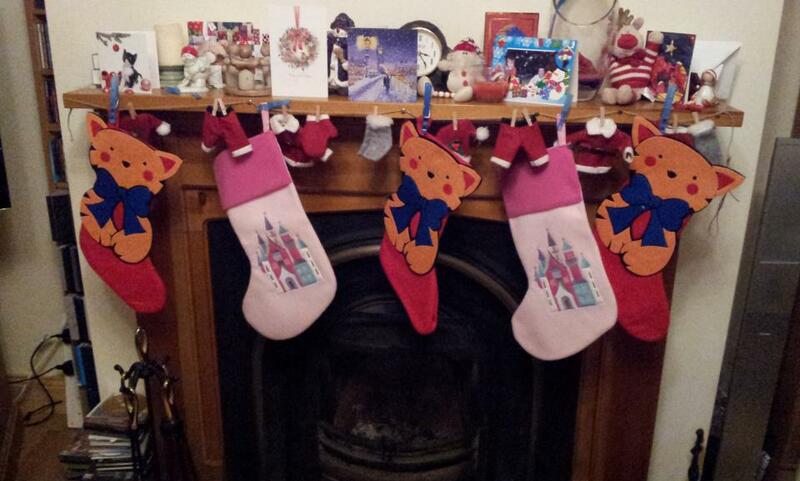 Volunteer as a host family this Christmas and take in children from Belarus. As it happened, a former colleague of mine is the son in law of one of the founders of CLI in Roscrea. The next day I made a phone call to him, he passed on my details to his father in law, and the wheels were in motion. After some amount of communication back and forth over the months, we managed to get forms and paperwork sorted for police clearance, and my former colleague was happy enough to supply a personal reference for us. We were then asked for our preference in terms of girls or boys, and age group. We decided on little girls in the 7 to 8 age group, the youngest children accepted on the programme. So the call went out the other side of Europe in the town of Mikashevichi, and two beautiful little ladies, Lera and Dasha were ushered into our lives. We attended a meeting of CLI just a week before the group arrived from Belarus. We were the youngest host family in the room, and one of only two newbie host families. Most of the others had been doing it for years, and stories of family bonds forged were incredible. One couple, in their late fifties told us of their Belarusian “son”, a 21 year old who phones them every Sunday night. Another family, pub owners in the area, said their 18 year old lad arrives to their house every Christmas, throws off his coat, declares himself home, and is out working in the bar in no time. Of course we all teased them that they were too mean to pay a lounge boy to collect the glasses in the pub and this was why they were hosting! All joking aside though, the warmth of stories was inspirational. The organisers smiled at us and told us that we might not realise it yet, but from now on we would be affiliated to CLI for life. I was inclined to believe them. 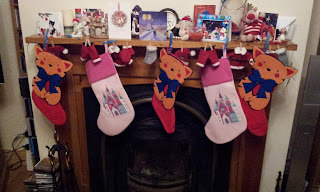 We were due to get holidays from work on the 23rd of December, and the children arrived on the 18th, so another host family had to step in and host them for the first five days. We finished up a very full on week at work on the Friday afternoon, then collected Ella, our interpreter, in Roscrea and headed up to the Offaly-Galway border to collect our girls. Driving into our cul de sac that night, we both suddenly were hit with the enormity of what we had taken on. Here we were, pulling up to our house with two seven year olds asleep in the back of our car, children who would be our sole responsibility for the next sixteen days. They did not speak English and we did not speak Russian. It felt as if we were imposters, who had stolen someone else’s children. What the heck had we signed ourselves up for? Our three cats were even more alarmed at the new arrivals. We might as well have let a pair of rabid little terrier dogs into the house with the way they reacted to their entrance. It was the first time in my life I have seen two cats try to exit one cat-flap at the same time. The next day was Christmas Eve. I stole out of the house first thing, and did the run down town to collect last minute groceries and the turkey and ham. 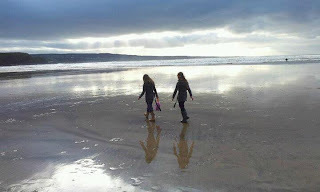 We had breakfast, and then took the girls for a drive out to Lough Derg to a playground. After that we took them shopping. Dasha being a very girlie girl begged us to buy her a pink Disney Cinderella dress, teamed with a pair of bubblegum pink Doc Marten style boots. Carrie Bradshaw, eat your heart out. Even better, she insisted on wearing the ensemble to mass on Christmas Eve. Who were we to refuse? Walking into mass to the strains of Away in a Manger in our local church, hand in hand with these two gorgeous little girls, was one of many magical moments this Christmas. In the past twelve days I think I have laughed more than I had in the previous six months. From the girls parading around our house dressed head to toe in elf suits, complete with pointy ears; to tickle attacks, to marathon games of twister or “tveester” as it will always be known to me, to blow drying their Barbie dolls’ hair after she went swimming in the bathroom sink, to Dasha having a hissy fit over bedtime and stamping her feet whilst wearing John’s enormous furry monster feet slippers, to hurtling down the water slide in the local leisure centre, to shouting “Spasibo, Santa” (Thank you, Santa in Russian) up the chimney on Christmas Day, it has been fantastic fun. There have been really special days, like when we brought them to see the sea for the first time in their lives. The Atlantic Ocean at Lahinch is impressive on any ordinary day, but to two seven year olds seeing the sea for the very first time in their lives; it was nothing short of awesome. Playing chicken with the waves on the beach ramp at high tide was amazing fun for all of us. Even the mundane jobs that every Mammy has to do day in, day out have felt great. Packing the enormous bag of towels, goggles and swimming gear for the whole family to go to the pool. Negotiating the sulks and tantrums over daily brushing of teeth and changing of underwear. Thank you, Google translator for giving me the Russian for the sentence “if you do not put on clean underwear, we will not go to the playground”. Doing their laundry, brushing the tangles out of their beautiful long hair. Cooking family sized dinners. Making pancakes for breakfast. Breaking up fights over broken hair clips and stolen fancy writing pens. Trying to get them to eat a reasonable amount of healthy food before breaking out the treats. All the stuff that makes me feel like a Mammy. Most of all though, it is seeing the joy in my lovely husband’s eyes that these two little mischief makers have brought us. When they arrived, Lera was a very serious little girl, and as quiet as a mouse, to the point of being painfully shy, whilst Dasha was the louder, more dominant child. Now Lera is well able to hold her own, and has blossomed into a really sociable little one with a great sense of fun. We found out that neither girl has a Dad in their lives, and so they have latched on to John in a major way. They adore him, constantly competing for his attention. They hang out of him, getting piggy backs all over the house, snuggling up to him watching movies. I might not have been able to make him a Dad in the conventional sense, but if Lera and Dasha return to our home on an ongoing basis, he now has the next best thing. This Christmas we gave ourselves the greatest gifts ever. The gifts of joy, laughter and love. Of seeing our house in the way we had intended, full of shrieks and noise and play, sometimes like the Waltons, more often like the Simpsons. And for all that we say, in the little Russian we know, Spasibo, Santa.